Cool action, but a plot that is too twisty and too confusing, reminiscent of the first mission impossible movie. 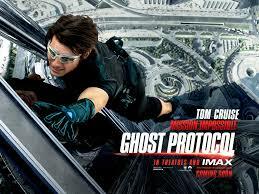 Mission Impossible: Ghost Protocol is a very good movie. It just isn’t quite as good as the last film. That third film was made by J.J. Abrahms, the wonder-kid at the peek of his game (this was his feature film debut) and boy was it smart. It was smart because of how simple it kept everything. we got a face villain and a direct mission dealing with the retrieval of a McGuffin (a device known as the rabbit’s foot.) we got exposure to Ethan Hunt (tom Cruise’s) life and his girlfriend. But now, in this fourth movie, Ghost Protocol, all of that goes away. Not even the villains are made very clear to us (there are three apparently, and only the girl villain is easy to keep track of.) Hunt’s wife is long gone, and aside from a brief cameo, pretty much so is Ving Rhames. It’s as if this movie tried to erase everything the third movie had accomplished, and to bring this one back to square one. big mistake. i know they wanted to get Abrahms to direct this fourth movie and they couldn’t. And I’m kind of glad for that, because each movie of the series has it’s very own director (unlike the harry potter series which would have benefitted from trying this approach), and as such has it’s own feel and look to it. The second movie, for example, is unmistakenly a John Woo film and that’s both a good thing and a bad thing (amazing action, terrible story.) but what about this latest film? Cruise and Abrahms (the producers of the movie) tried to do what they did when they gave Abrahms a shot. They tried to get someone who had never made a feature film before. They got brad bird, the man behind The Incredibles and Ratatouille. Those are good movies, sure, but nothing in there says that he can make a feature film, let alone a huge mission impossible movie. And therein lies a major problem with this movie. the filmmaker chosen here was not a very good choice at all. with J.J. Abrahms, cruise was going off the man’s directing work with the spy television series alias when he hired him. With Brad Bird, there’s nothing on his resume that even comes close. i can’t even fathom how they thought this guy would be the right fit for this movie, other than that they felt like they took a huge risk with Abrahms and loved how it paid off, and were hoping to take an even bigger risk this time. perhaps they hadn’t heard the expression lightning never strikes the same place twice. They got lucky the first time, but didn’t need to try to top their risk even more. 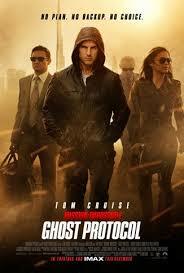 sooner or later, it was going to blow up in their face, and in the case of Ghost Protocol, it unfortunately came sooner. Considering the filmmaker, it’s a wonder this movie turned out as good as it did. I mean it’s certainly better than the second movie, which was by woo, a very accomplished action director. this one is most similar to the first film, with cruise’s team of imf agents (impossible mission force), getting setup in the beginning and then going rogue after that to prove their innocence. i understand that now with four pictures in (that’s a lot for any franchise), the writers said “let’s not get too far away from the original movie that started this all,” and so they intentionally went back to the first movie. but whatever happened to keeping it fresh and trying something different? that’’s exactly what the third movie did and that’s exactly what made it so great. like the very first movie, this fourth film is intentionally tricky and confusing. like the first movie, there’s an early scene with the imf agents all setting up somewhere, that goes terribly wrong. and like the first movie, they are now outcasts from their own agency. ghost protocal opens with ethan hunt in prison and simon pegg’s character (returning from the third movie), helping to bust him out. it’s kind of a funny opening, especially with pegg being so loose on the controls of which prison cells he opens up just to create a distraction for the guards. soon we are hearing about an imf agent who was killed (josh holloway from tv’s lost, who i wish was in this movie a little more,) and learning that some villains are after the nuclear launch codes that are being kept in the kremlin building in moscow, russia. so that’s where everybody is off to. both our heroes and the villains. there’s a cool technology scene involving a screen that hunt puts up which projects the image of an empty hallway to anyone looking at it. but considering that both the heroes and villains are in the same place at the same time, you would think we could get some kind of a confrontation scene. some kind of an early action, fight scene. at the very least, something that could help us identify a little more who the villains are. we don’t get any of that. Instead, everybody is wearing masks and disguises so that the very closest we get is having the villain and the hero walk by each other without either one of them noticing. This is not fun. Compare that to Ethan Hunt in the bathroom at the Vatican in the third movie, tackling villain Phillip Seymour Hoffman, knocking him out, and then impersonating him. and here, in Ghost Protocol, our heroes and villains barely know who each other are. The Kremlin blows up and hunt and his team are setup to seem like the responsible party. that leads to this IMF squad being disavowed and dismissed by the us president (Tom Wilkinson delivers the message in an all too brief came appearance.) Now it’s up to our heroes to rush off to Dubai and intercept a meeting between the seller of the codes and the buyers. I do like the way there are two different scenes going on at once here, with two different hotel rooms, one right on top of the other, but boy is it tough to keep track of everything. and yes, we get the great action scene of hunt hanging off the side of the tallest building in the world, here in Dubai. it’s the highlight of the film, as seen on all of the trailers and posters and billboards. and it is certainly cool. but after this scene, the movie still has a solid portion of it’s running time left, and not much going on. not much that’s fun or easy to follow anyway. the crew goes to India where they have to send in their woman agent to seduce a rich guy while Jeremy Renner’s character ends up hanging around in the air because of magnets (don’t ask) and Ethan Hunt ends up in a fight in a parking garage. it’s too much action with too little explanation. the problem with mission impossible: Ghost Protocol is that it’s plot isn’t very well thought out, especially in the approach of how this plot will be presented to the audience. like the first movie, I’m sure that upon multiple viewings of this film it will all start to make sense, and seem a lot cooler than it did the first time, but why make it so tricky to follow the first time? the action is cool and it’s certainly a smart movie, but that just might be it’s downfall. it’s too smart and yet not smart enough to realize that simpler is better. the third mission impossible movie had Phillip Seymour Hoffman as the villain, Laurence Fishbourne as the head of the IMF agency, and a team that consisted of ving rhames, Maggie Q, and Jonathan Rhys Meyers. That star-studded cast went a long way to delivering an outstanding movie. and now, in Ghost Protocol, we don’t get any of those faces returning (okay, a brief cameo by Rhames), and we don’t even get a recognizable face as the villain. It’s a disaster. Luckily there are a number of scenes that are fun and that we can roll with, and so the movie in the end turns out to be okay, but it is sure a drop down from the third movie and a definite disappointment.